My kids can't have touching, dripping, or general "grossness" of any kind when it comes to food. The food must definitely not come in contact with any thing else on the plate. In fact, some times, some food needs it's OWN plate just to be safe. If something is drippy or crumbly, it's almost a sure bet that it is not going to be eaten. Things must appear neat, tidy and whenever possible- cute. Why cut a sandwich in to four squares, when you could cut it to look like an angel with wings? Why put a salad together, when you could arrange it to look like a face? Now, if you know me AT ALL, you know that this is about as foreign to me as speaking Chinese. In my mind, you do what is easiest. However, I have become something of a convert in this department, since both of my older kids have had some near-death-experiences (in their minds) when food has touched, or crumbled, or dripped. After a million lectures of how they need to eat the blasted food..or else- I have realized that it is just easier to spend five seconds to prevent "disasters", thereby ensuring that my kids eat their food. 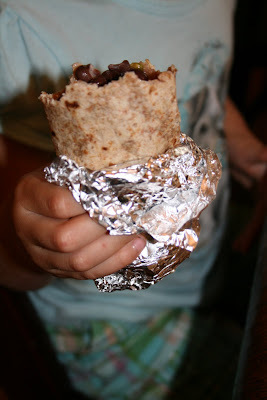 And so, after many "drippy" burritos (thanks to those pesky black beans) we have found the solution and now wrap the bottoms in tin foil. 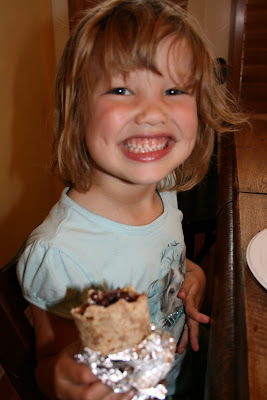 Here is Shelby showing you how happy she is to have a "neat burrito". On this day, Shelby got the newest Ranger Rick in the mail. 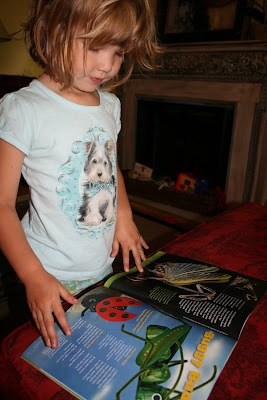 Grandma Martha sends this magazine every month, and Shelby EATS-IT-UP. 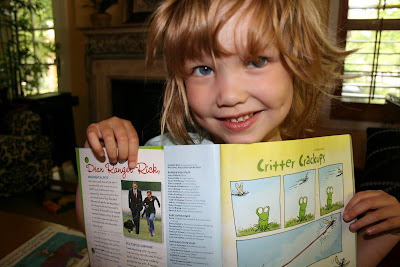 For kids that are interested/addicted to animals- this magazine is gold. She immediately spotted the small picture of President Obama, or "Obama" (as she calls him- since they are very tight), and his new Portuguese Water Dog. She wanted me to take a picture of it. She is very excited that she is going to be getting the same type of dog in the future. 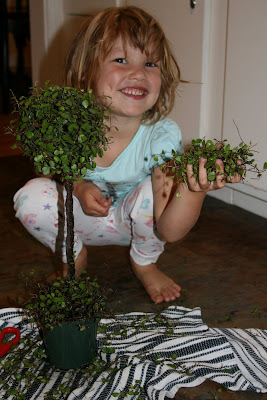 Shelby begged to give my topiary a "hair cut". I should have known better, with all of the hair cuts she's given herself, but I said yes. I almost screamed when I walked in to the kitchen a few minutes later. I had to take the picture to keep from screaming. It will be a while before she is allowed to give anything a hair cut again. These are a few scenes from Shelby's day. Never a dull moment...well, almost never.